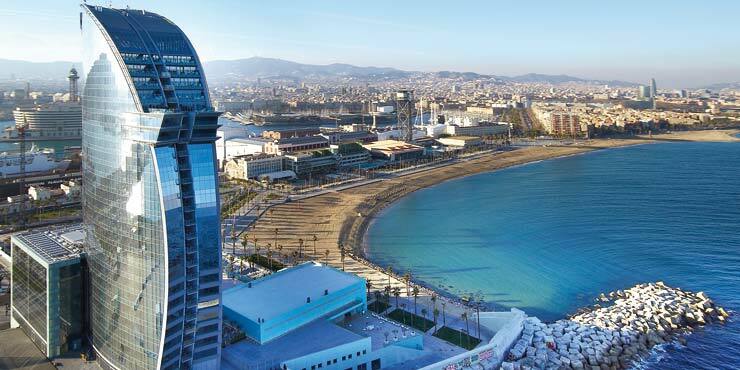 The first W Hotel in Western Europe has been developed on a spit of reclaimed land in the new La Barceloneta quarter. The elegant and distinctive hotel building resembles a giant sail. Different light conditions are reflected in the iridescent glass façade and give the building a constantly changing appearance. The interior furnishings are presented in the avant-garde style with modern design features, glittering décor and vividly colourful light installations. The highly functional GROHE Atrio basin mixers and floor-mounted bath mixers in the modern bathrooms of the W Hotel are also strikingly elegant. In combination with a concealled WC cistern, the stylish GROHE Skate Cosmopolitan wall plate ensures water consumption is kept to a minimum in the bathrooms thanks to the needs-driven supply of water.